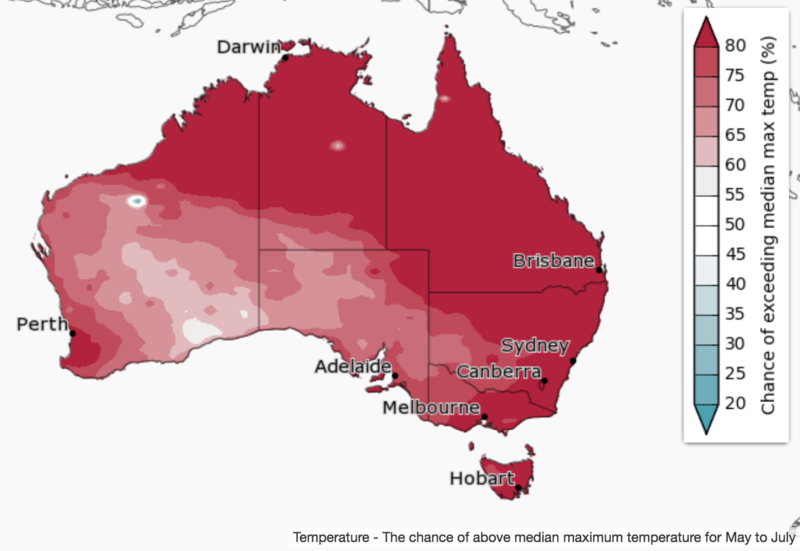 May to July is likely to be drier than average over some parts of eastern Australia, but wetter for parts of inland WA, and scattered parts of the northern Australian coastline, acording to the Bureau of Meteorology’s ‘first look’ seasonal climate outlook for May, June and July, released today. Most of the rest of the country shows no strong tendency towards a wetter or drier than average three months. For May, some parts of the southwest and east are likely to be drier than average, while inland WA and parts of the far north are likely to be wetter. Most of the country has equal chances of a wetter or drier than average month. 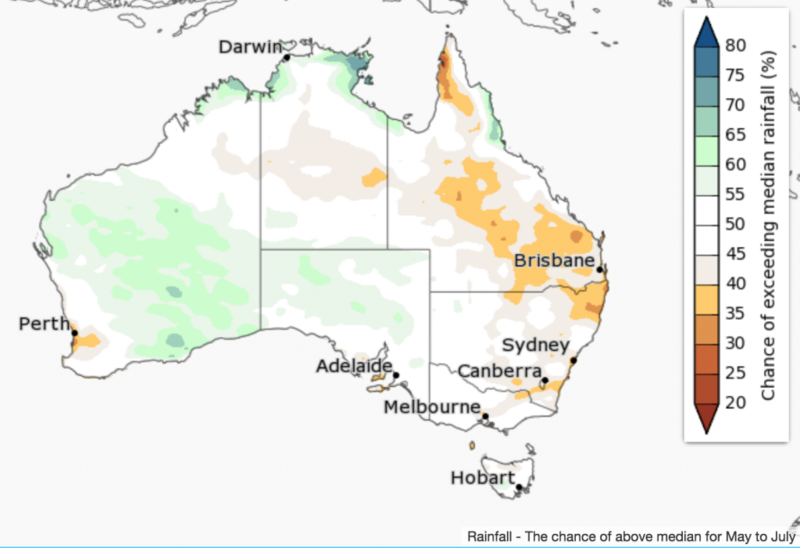 While both the monthly and three-monthly outlook shows wetter conditions are likely in the north, May is the start of the dry season in northern Australia, which means little or no rainfall is normal at these locations. 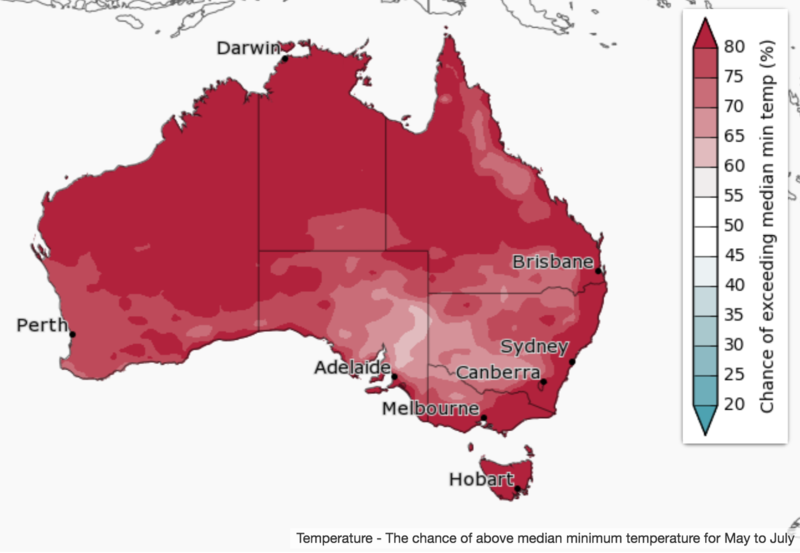 Warmer than average days are very likely for most of Australia for May to July. Nights are also likely to be warmer than average overall, however, the forecast drier than average conditions could bring more cloud-free nights, increasing the risk of frost in susceptible areas. Historical accuracy for May to July maximum temperatures is moderate to high across large parts of Australia, but low to very low over southern SA, western Victoria, eastern NSW, central Queensland and the Pilbara in WA. Minimum temperature accuracy is moderate for the northern half of the country and Tasmania, and low to very low elsewhere. See map for more details.